It is replaced by the Zebra GC420t. Leading the way in versatile and affordable desktop printing-- The thermal transfer (TLP) 2844 barcode printer brings a new level of performance to the Zebra desktop family. This space-saving user-friendly printer delivers optimal performance in today's on-demand desktop labeling applications. The TLP2844 is loaded with impressive features and a small price tag! TLP 2844, Thermal transfer printing, 203 dpi, 4" print width, USB, Ethernet, and Serial Interfaces, and US power cord. 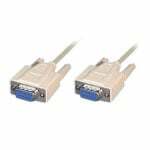 Order cables separately. TLP 2844, Thermal transfer printing, 203 dpi, 4" print width, USB, Parallel, and Serial Interfaces, Real-time clock, and US power cord. Order cables separately. TLP 2844, Thermal transfer printing, 203 dpi, 4" print width, USB, Parallel, and Serial Interfaces, 256KB RAM, 512KB flash. Includes US power supply. Order cables separately. TLP 2844, Thermal transfer printing, 203 dpi, 4" print width, USB, Ethernet, and Serial Interfaces, Real-time clock, and US power cord. 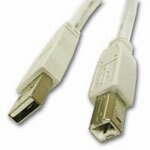 Order cables separately. The Zebra TLP2844 is probably the most used label printer ever created. 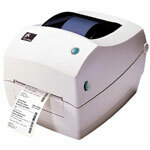 It is the perfect printer for small volume applications like shipping labels, retail product labels, or asset labels. Extremely reliable and very easy to load with media make it an ideal choice for users new to barcoding. Zebra provides one of the widest selections of labels and ribbons for their desktop line in the industry so whatever size you need, they will have it available. The TLP2844 is scheduled to be replaced by the GK420t so migrating to the new model offers greater memory and a faster processor while still using the same media supplies. The TLP2844 is for any small volume application that wants an easy to use model with all the options of a more costly industrial printer. 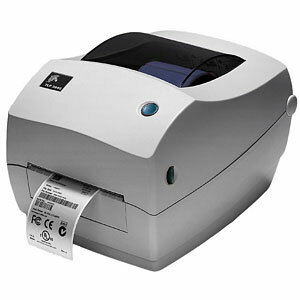 The thermal transfer TLP 2844 barcode label printer is ideal for applications requiring a space-saving, desktop-size, 4.09" (104 mm) printer. This user-friendly printer delivers optimal performance in today's on-demand desktop labeling applications. The TLP 2844 has a sturdy construction with a double-walled ABS casing.